John Gerald Hodgson obituary. Carnes Funeral Home. 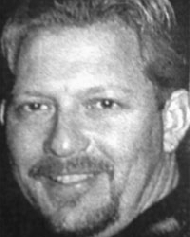 John Gerald Hodgson, 49, of Alvin, Texas passed away on 7-19-13 at Christus St. John’s Hospital in Nassau Bay, TX with his family and friends at his side. John was born on 10-10-63 in Houston, TX. He has been a resident of Alvin, TX since 1983. Employed as a Disc Jockey for a number of years, and many other companies in his lifetime. He enjoyed all sports, boating, motorcycling, music, and loved to party with his much beloved family and great friends. John is preceded by death by brother, James Garrett Hodgson and ex-wife, Monique. Survived by son, John Gerald Hodgson, Jr.; grandson, John Davin Hodgson both of Alvin, TX; parents, John and Shirley Mora Hodgson, of Manvel, Tx. ; sister, Terri Hodgson Guthrie and husband Chris of Seabrook, TX; in-laws, Nell and Harvey Shimek of Alvin and many nieces, nephews, relatives and best friend Princess, his dog. Memorial Services will be held on Saturday, August 10th at 3:00 p.m. at Sacred Heart of Jesus Catholic Church, 6502 Co. Rd. 48 in Manvel, TX, Fr. Tom Ponzini will reside. May you Rest In Peace John and may God’s Perpetual Light Shine Upon You.